Stop #2: No Grumps Here! Day #2: No Grumps Here! When your husband is owner of the greatest team in the NFL, you don’t spend Sunday afternoons driving around looking at scenery. Okay, well, he’s a shareholder, one of an intimate 363,491 fellow shareholders. Still, it’s very important that my husband watch the games. So Sunday, after attending the friendly and welcoming Faith Lutheran Church in Reedsburg and checking out the Shoe Box in Black Earth, we headed on down to Mount Horeb to watch the Green Bay Packers. Mount Horeb, population 7000, is a quaint little town. Hey, it’s the troll capital of the world! It’s also home to the Fisher King Winery, a delicious Main Street presence, and the Duluth Trading Company, a flagship in a wonderful, creaky-floored mercantile building. 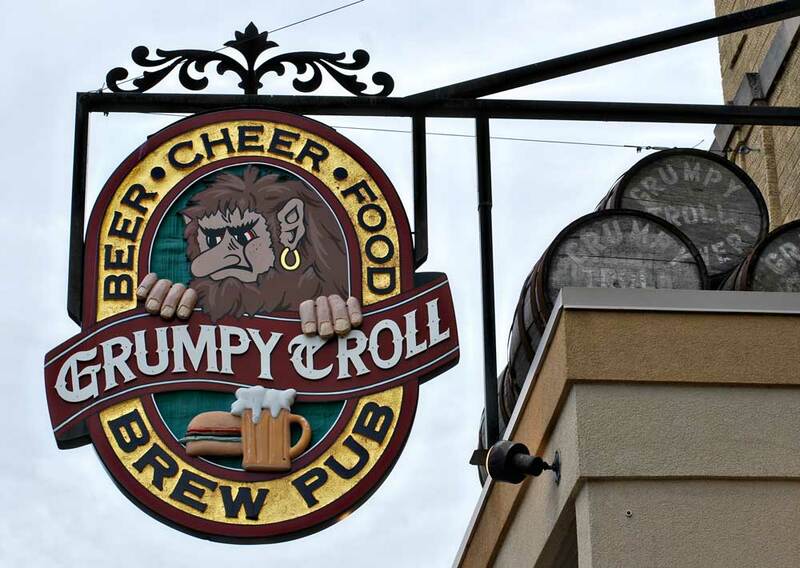 But most important to my husband on Sunday at noon, Mount Horeb is home to the Grumpy Troll Brew Pub. What a fun place! Located in the 1916 Mount Horeb Creamery building, it’s been a restaurant and brewery since 1996. There’s a family restaurant on the first floor and a pizzeria on the second, along with the very important large screen TVs in every which direction. Is this a young and thin Martin Luther? Just wondering, you know, with Reformation coming up and all. 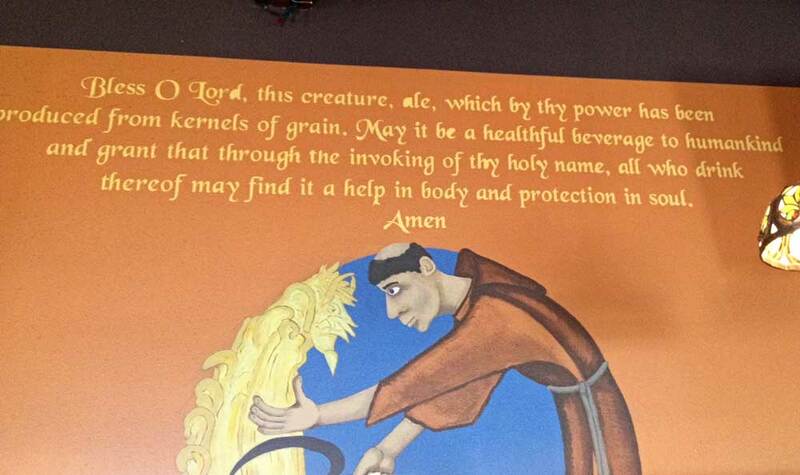 This mural is on the wall of Grumpy Troll’s upstairs pizzeria. Anyway, our daughter and son-in-law joined us and we enjoyed sharing good food and beer. Best of all, the Packers won 27-24 in a last minute drive. Based on the loud whoops, there were no grumpy trolls watching this game! I feel bad awarding brewmaster Mark Knoebl only one stein, especially since he’s won so many awards elsewhere. He features up to twelve beers on tap, of all tastes and styles. 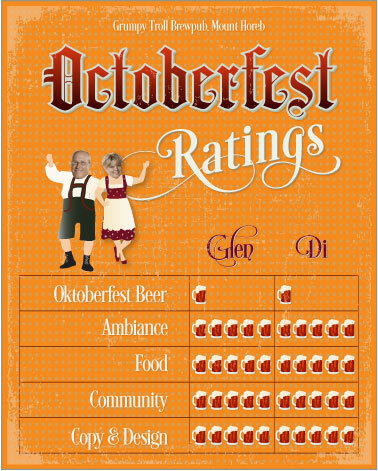 Refreshingly, his beer menu changes regularly and as it happened Sunday an Oktoberfest wasn’t on the list. Oh well, there were many others to try. Our son-in-law, a hobbyist brewer himself, and daughter both appreciate a hoppier flavor and their eyes lit up when they tasted the Hoppa Loppa. Of course I loved the old building. It’s wonderfully preserved and furnished with appropriate decor. The staff was super friendly and it was a fun place to watch the game. With lots of interesting shops, one could spend a fun day in downtown Mount Horeb. The area also boasts a bike trail, parks and many other attractions. Sadly, one of its greatest historical sites, Little Norway, is closing after 86 years. I love it! 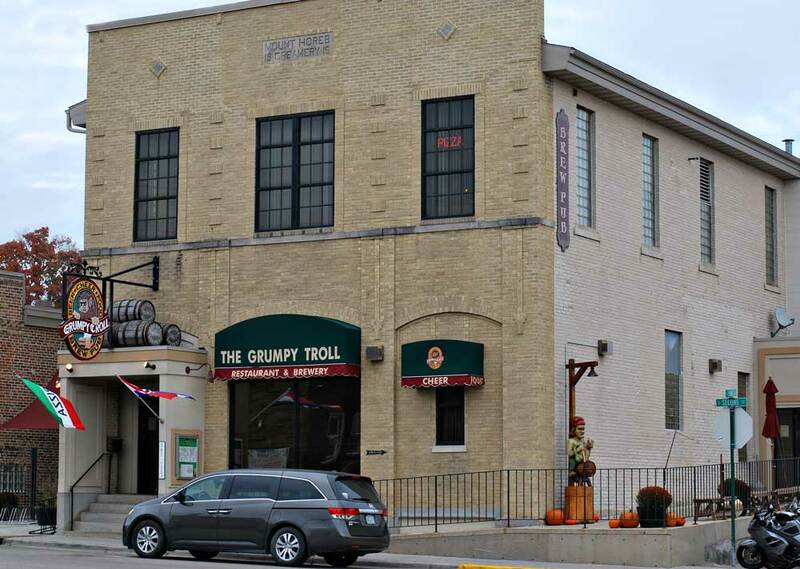 The Grumpy Troll has a super website with fun information about its history, the building, its food and beer. 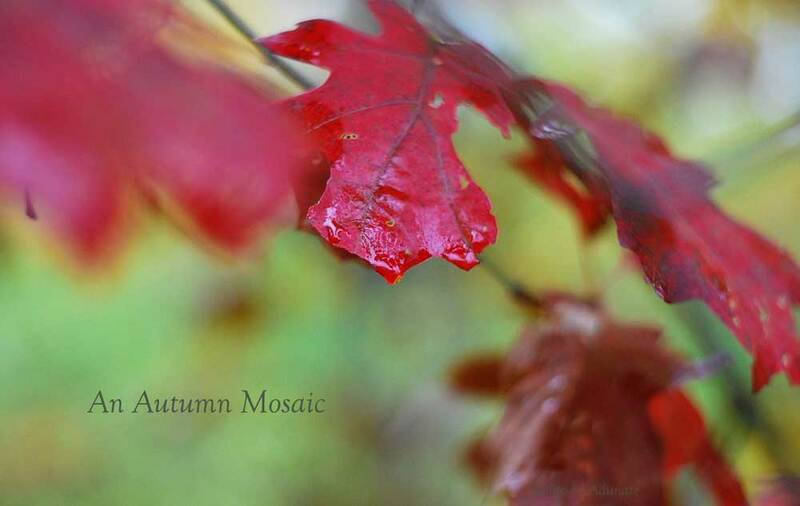 Be sure to keep scrolling down while on the home page so you don’t miss any of this good stuff. And who wouldn’t like a logo with a cute grumpy troll guy? !